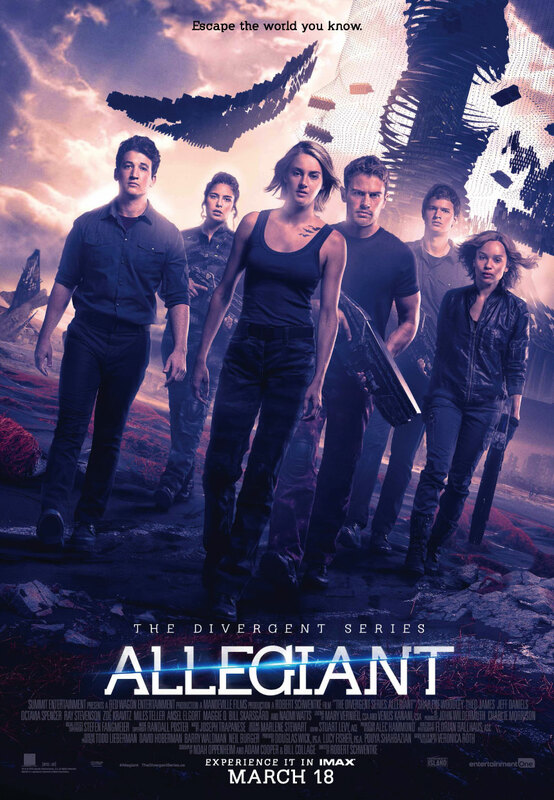 Allegiant is now showing in cinemas everywhere and is distributed in Australia by Entertainment One. The biggest problem that the third film in the Divergent series, Allegiant faces is it's existence. This film that is filled with flaws exists only out of necessity considering the series has begun and must now be finished, which is particular worrying for the final instalment to be released in 2017, Ascendant. Those who have read the books by Veronica Roth will know that the first book, Divergent starts the series in spectacular style, with the following two not able to follow in the original's footsteps. The same thing is happening with the films. They are progressively becoming less entertaining, enjoyable and successful overall. Allegiant is incredibly weak and does not have the ability to excite or provoke anticipation for the finale. What it does do is make one believe that Insurgent should have been the final film because even though it was definitely more entertaining, it did not have a strong cliff-hanger ending which made people look forward to the next two films. With Jeanine now dead and the world of factions now at an end, it would seem that Chicago would now be at peace. However, the brutality continues and Jeanine's legacy seems to be carrying on in her absence. Divergents, Tris (Shailene Woodley) and her boyfriend, Four (Theo James) decide to escape this new Chicago by climbing the wall to see if the rest of the world can offer them solace. However, what is on the other side of the wall is not the peaceful world they were expecting nor that it is pretending to be. The Divergent series (both the books and movies) draw much of their inspiration from other teen fiction film adaptations. Thanks to the Harry Potter series where the final book was split into two movies, both The Hunger Games and Divergent series have attempted to do the same based on it's success. One can understand why this would be a profitable venture for production and distribution companies when the series already has a massive fan base or the previous films have been extremely successful. Of course, the final book in a series does often have the most happening in it so having it split across two films also solves the problem of squishing as much information as possible into an appropriate running time. The difference between Harry Potter and both The Hunger Games and Divergent was that it wasn't decided until late in series of films (which admittedly is a series with more films anyway) that Harry Potter and The Deathly Hallows would be divided into two parts, while the other two series made this decision after the first film. Focusing primarily on Divergent, the series has really not taken off the way the film makers would have hoped and like the books, it is losing momentum with each film. The decision to make the book "Allegiant" into two films is now more than likely a fatal one as far as the film makers are concerned. Allegiant does not make the final film enticing to anyone and it is almost painful acknowledging that there is still another film to go after this. Even if you have not read "Allegiant" and have only heard that it is the weakest book in the Veronica Roth series, one can still understand why. Allegiant feels as though it is far removed from the two previous movies and like a completely different story rather than a continuation of Divergent and Insurgent. There are absolutely links between with the past films and quite a few viewers who have not seen the previous films will not understand them, but the story itself doesn't feel as though it neatly connects to Insurgent. This is perhaps because the end of Insurgent felt so final without a clean cut cliff-hanger that the beginning of Allegiant is met with a feeling of "Oh, here we go again..." With this feeling, it is hard to take anything seriously in this monotonous film. However, it is not just the story that feels weak, the visual aspects of Allegiant are quite awful. Slow motion is used to no benefit in a number of scenes and provokes more eye-rolls than feeling of awe. One of the worst parts about Allegiant is an issue which is a deal-breaker for any action film in this day and age. As this is a dystopian film, the majority of it is obviously filmed on green screen, but you should not be able to tell this by watching the film and it is a crime that the use of a green screen is obvious. Many of the special effects also come across as unrealistic. These things could be forgiven had Allegiant been a low budget film, but with a budget of $100 million this is far from the case. Only a tad of the production design of Chicago is somewhat impressive. 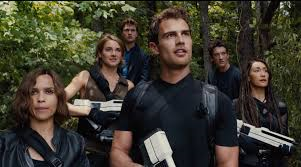 Much of the acting talent in this film is being wasted, particularly that of Shailene Woodley and Miles Teller. The two of them are of considerable talent which has been seen in their past films and the past two Divergent films, but their roles of Tris and Peter are not written to be as meaty as what they should have been. Tris lacks the courageous and strong personality we have come to know and Peter is basically repeating the same character patterns that he did in the past two films and becoming rather annoying in the process. Naomi Watts as Four's mother, Evelyn probably isn't given enough to do in the film to make enough of an impact, but her scene with Four's father, Marcus (portrayed by Ray Stevenson) is particularly memorable for the hard emotion she shows in it. Casting Jeff Bridges as David was a rather awful decision as the character is supposed to assert authority over all he meets and be rather domineering and menacing, yet he comes across purely goofy. Every time he says the name "Tris" it is a moment that calls for unintentional laughter. It is not often that a final film in a series is met with a feeling of dread and not excitement and anticipation, yet that is exactly how Allegiant makes us feel about Ascendant. This extremely flawed film is almost the kiss of death for the series' next film, but one can only hope that there is no way it can get worse than this.